On 9th February the Community Centre Trust will be holding a Coffee Morning between 10am-12pm at the Old School on Charter Lane. There will be tea, coffee, cakes, bingo, a raffle & a book exchange. So why not bring your family for a drink & meet up with friends. On 12th January the Community Centre Trust will be holding a Coffee Morning between 10am-12pm at the Old School on Charter Lane. There will be tea, coffee, cakes, bingo , a raffle & a book exchange. So why not bring your family for a drink & meet up with friends. On 8th December the Community Centre Trust will be holding a Coffee Morning between 10am-12pm at the Old School on Charter Lane. There will be tea, coffee, cakes, bingo, a raffle & a book exchange. So why not bring your family for a drink & meet up with friends. On Saturday 24th November we will be holding Messy Church at the Old School Community Centre on Charter Lane. Also, f you can volunteer your time to create crafts with the children please contact Margaret Stewart at margaretstewart@btconnect.com. On 10th November the Community Centre Trust will be holding a Coffee Morning between 10am-12pm at the Old School on Charter Lane. There will be tea, coffee, cakes, a quiz, a raffle & a book exchange. So why not bring your family for a drink & meet up with friends. Over the summer holidays we have had a restoration team in replacing the flooring in the main room. Today the trustees visited the Old School to see the finished result & as you can see from the photos below it looks amazing! Please join us on 15th September for our next coffee morning to see the floor for yourself. All the trustees would like to say a HUGE thank you to everyone who supports the charity. 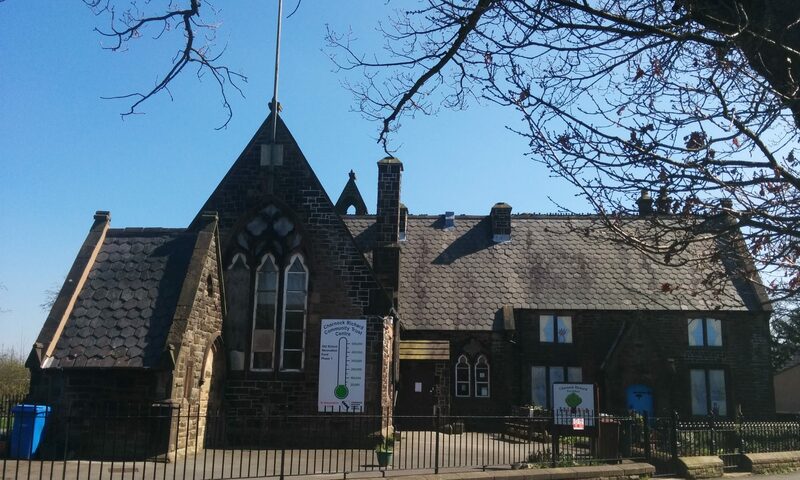 By attending coffee mornings and providing donations you have helped us restore a vital part of the Old School which will help us with future fundraising & applications for funding bids.